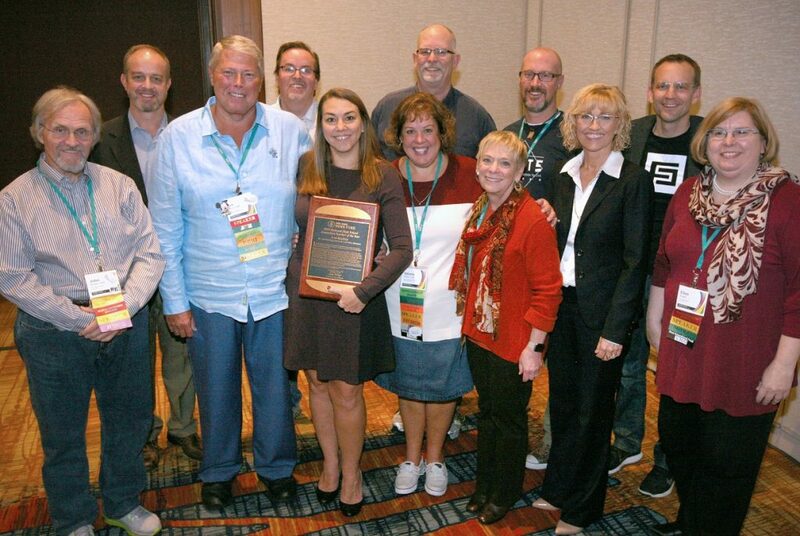 Pictured above are previous DJNF Teachers of the Year at the 2016 JEA/NSPA Fall National High School Journalism Convention in Indianapolis (L-R): John Bowen, Mitch Eden, Jim McGonnell, Dow Tate, Lori Keekley, Karl Grubaugh, Valerie Kibler, Candace Bowen, Jim Streisel, Robin Sawyer, Aaron Manfull, Ellen Austin. Photo by Bradley Wilson. The Columbia Scholastic Press Association, the Dow Jones News Fund, the Poynter Institute and The Wall Street Journal will select one National High School Journalism Teacher of the Year based on their work during the 2017-2018 academic year. Along with the Teacher of the Year, an additional eight (8) high school journalism teachers and media advisers will be named Distinguished Advisers and Special Recognition Advisers. ♦ a digital subscription to The Wall Street Journal. The Teacher of the Year will address journalism educators and media professionals during CSPA's annual student journalism convention in New York City. The honoree will also join a select group of 59 teachers who have previously been honored with this premier achievement. CSPA has launched an online application to collect the information needed to select the National High School Journalism Teacher of the Year. Completion is requried by each candidate. We seek those with at least three years’ experience, include those who have been honored as lifetime achievement, state or regional winners by local, state and regional groups. After submitting your application, we will ask you to send six (6) copies of your single best newspaper/newsmagazine issue from the 2017-2018 academic year to the CSPA office in New York City. The deadline to apply for the 2019 Teacher of the Year is Friday, November 16, 2018. The Dow Jones News Fund (DJNF) established the program in 1960 to select one outstanding high school media teacher or adviser each year as National Newspaper Teacher of the Year. Today, the award is referred to as the National Journalism Teacher of the Year and recognizes a high school educator who teaches innovative media techniques, mentors students to produce award-winning journalists and encourages students to consider media careers. Along with the Teacher of the Year, eight additional high school teachers and media advisers who go beyond the call of duty are selected as Distinguished Advisers and Special Recognition Advisers. CSPA has been a valued co-sponsor of the program for decades, featuring the Teacher of the Year at an advisers luncheon during its Spring convention, providing accommodations, promoting the program and inviting honorees to present sessions. This is the second year that CSPA will take the lead role in promotion, selection and participation of the winners, with DJNF becoming a co-sponsor.